Do you have to constantly switch your distance eyeglasses to reading glasses when doing close-up work or reading fine print? In other words, do you have a separate pair of eyeglasses just for reading, besides at least one other pair for distance viewing? This isn’t necessary when you use stick-on bifocal lenses. Simply put, these are soft semicircles that can be pressed onto eyewear by using a tissue or soft cloth. Stick-on bifocals are the magnified portion of reading glasses or bifocals, minus the other parts of the lenses. If you’re frustrated with having to keep up with two or more pairs of eyeglasses, then take heart. By using bifocals that stick on with water, you can convert your eyeglasses, safety glasses or sunglasses into instant reading glasses, bringing small print into clear focus. What’s more, you’ll only need a single pair of eyeglasses. 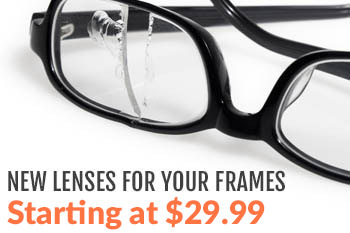 They provide exceptional clarity for reading and viewing close-up objects. You can easily remove and reuse them. Once they’re removed, they don’t leave any sticky residue or glue. 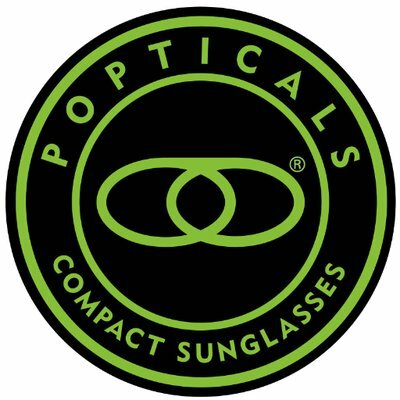 These lenses are excellent choices for people who need eyewear magnification that isn’t a prescription, such as sunglasses. Maybe you don’t need glasses for distance vision, but because of your age, you have to use reading glasses. 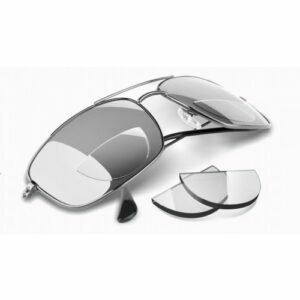 You can customize the shape by using sharp scissors to trim your lenses. They work and look like regular bifocals. Stick-on bifocals cost considerably less than regular bifocals, but still look and function much like them. These flexible, soft lenses are designed to stick to a wide range of eyewear, including sunglasses, safety glasses and shooting glasses. The three main steps involved in applying your stick-on bifocals can be summed up three verbs: wet, position and dry. To insert your bifocals, apply a single drop of warm water on the interior of both the lenses. Then, using your finger, gently position the bifocals where you want them. Your lenses should be about 2.5” apart. After they’re properly placed, use a soft, lint-free cloth for removing any air bubbles or excess moisture. Allow 24 hours for your glasses to dry so they have maximum sticking power. But don’t wait longer than 24 hours because this can compromise their holding power. Just as traditional reading glasses, the lenses come in a full range of reading strengths, increasing in increments of 0.25 diapters, from +1.25 diopters to +3.00 diopters. To determine which one is right for you, try on some readers at a pharmacy and read the small print of a product label. You can also use a diopter test to decide on the proper strength of your reading glasses. Stick-on lenses are constructed of polymer aspheric. These lenses are lightweight and have a 1.2” diameter. You can position your stick-on bifocals to the top portion of your lenses. This is especially helpful if your job forces you to continually tilt your head backward because you have to work above your head. However, it’s important that the bifocals are installed upside down to ensure the round part faces the top of your lenses and not the bottom. Changing the position of your lenses can be easily done while the lenses are still wet. Remove your stick-on bifocals if there’s an obstruction to your line of vision. These lenses may not bond with some types of sunglasses or safety glasses because the curvature of the lenses is too much or more than a 6-base curve. When this is the case, consider buying bi-focal safety glasses of a lens curvature that’s more than a 6-base curve. Keep your lenses housed in their protective case when you’re not using them. When trimming your lenses, it’s better to trim the curved, bottom portion, rather than the top, straight part. Use oil-free soap to wash your lenses. For more information about stick-on bifocals, as well as other types of eyewear, please contact us and learn about our different products.
) I care for such information much. I was seeking this certain info for a very long time.